Researchers in developing countries often find themselves on the front lines of emerging global challenges. However, these same researchers face significant barriers to scientific discovery and career development. They are working with limited resources but limitless potential. We see it as part of our mission to enable all researchers and are proud to announce that we are teaming up with Seeding Labs to better serve those in developing countries. Seeding Labs, a nonprofit founded in 2007, strives to expand the opportunities and scientific resources available to researchers in developing countries--because scientific talent is everywhere, but resources are not. Through its flagship program, Instrumental Access, Seeding Labs partners with donors to supply surplus lab equipment to carefully-screened research and teaching departments at universities around the world. Connecting tools and talent is just a first step; going forward, Seeding Labs hopes to expand its activities by facilitating connections to mentorship and networking opportunities, publishing assistance, and more to Instrumental Access participants. Like Seeding Labs, Addgene also feels it’s incredibly important for scientific breakthroughs, reagents, and know-how to transcend national borders and help people around the world. As part of our own mission, we strive to help build the international scientific community and are always taking steps to increase plasmid distribution and disseminate knowledge around the globe. 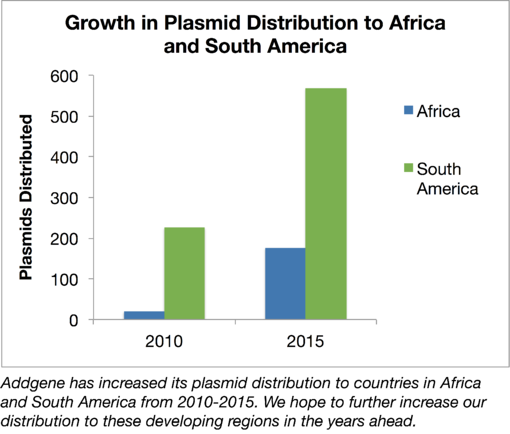 As you can see from the chart below, we are making great progress toward spreading the Addgene community into developing regions like South America and Africa, but we need to expand our efforts to find new and creative ways to reach developing countries. As part of these efforts, we will be working with Seeding Labs to award plasmids to research labs that have received Instrumental Access equipment from Seeding Labs and that can demonstrate that these plasmids will effectively advance their research. The map below shows all the countires that have requested plasmids from Addgene since our inception in 2004. In the near future, we hope to eleminate much of white space on this map and increase plasmid sharing across the globe! We hope that these awards will both accelerate biology research in the labs they’re granted to, as well as shine a light on some of the great minds working in developing countries. As the world continues to face global challenges, we hope to empower those that need to face these challenges locally. We look forward to more collaborations with Seeding Labs and organizations like it.